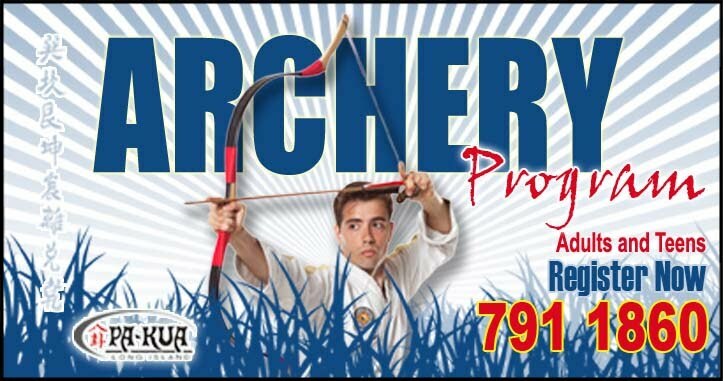 Archery is now a regularly scheduled class at Pakua Long Island. You can also view the class schedule here. in the South Shore Standard. Chaikin began practicing Pa-Kua when he was a small child, and has been teaching the many aspects of the art full-time for 20 years. On Tuesdays, he welcomes archery students into his studio, where they start the class by saluting and running laps around the mat to get their blood flowing. After this, the students are told to fetch their bows, and get in position to practice stringing them. After several minutes of stepping over their bows, and perfecting stringing them, one of the more advanced students, Master Jacob Rosenbaum of Brooklyn, a second-degree black belt in martial arts and a gray belt in edge weapons, steps to the front and leads his fellow students in more stretches, poses, and kicks. “Pa-Kua is essentially a teaching art,” said Chaikin, who compared his students leading movement to instructing someone on the proper way to throw a rock. “If you throw a rock with the aim of stopping at a certain point there’s going to be X amount of power, but if you throw the rock with the intention of it going much further, through the object, it’s going to hit that object with a much stronger impact,” he expounded. After about 30 minutes of activity without firing a single arrow, Chaikin’s class saluted then retrieved a large pad riddled with small holes. The students begin unloading arrows one at a time at the target. One by one, they notch the arrows, raise their arms high over their head and pull back on the string, all the while keeping their eyes fixed on the target. They bring their arms down and release simultaneously, all of them hitting the pad. There are other types of shots they practice as well, such as releasing the arrow while transferring their weight to their back leg, or shooting from greater distance. Master Rosenbaum and Master Dominique even fire from one knee and practice unleashing multiple shots while walking towards and away from the target. Regardless of skill, Chaikin quietly corrects small mistakes his students make and encourages them to challenge themselves and attempt more difficult positions. He also drums up friendly competition, having groups of students try to unload multiple shots in short periods of time, and granting bonuses for accuracy. When class is over, all the students assume their original positions and salute before carefully stepping over their bows and slowly unstringing them. They salute again and class is over.